Talk to me about Grey Goo and you’ll witness my transformation from the grumpy, hirsute Fraser of 2014 back into the bright-eyed giddy Fraser of the ‘80s and ‘90s, excited about everything and bouncing off the walls. 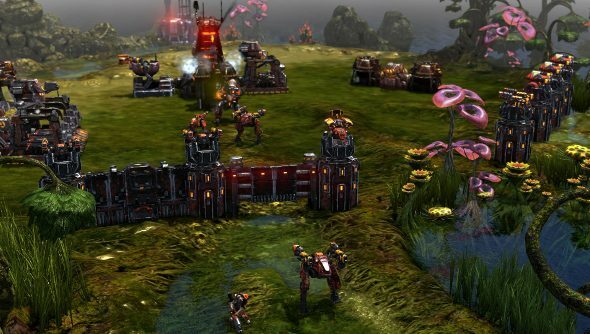 The likes of Blizzard and Relic dominate the RTS scene with their different but equally polished formulae, and there’s little in the way of refreshing surprises. But there’s Grey Goo, and it’s pretty bloody different. Petroglyph have taken the idea of asymmetrical factions and run with it, really, really far. The beta, humans and titular goo might as well be playing a different game, each compelling in their own right. Come January 23rd, Grey Goo will be spilling out of Petroglyph and onto PCs, which will be messy, but totally okay. Petroglyph have been hosting quite a few livestreams over the last few months, the latest of which you can see below. And with the announcement of the release date, we’re getting some developer diaries to tide us over until the gooey nanomachine invasion. In the first, Petroglyph chats about the impact of testers and players at trade shows.